After denied ticket from BJP for Nurpur assembly segment, MLA Rakesh Pathania got a much needed boost when thousands of his supporters from every nook and corner of his Assembly segment thronged the Kandwal barrier to receive him after his return from Delhi. 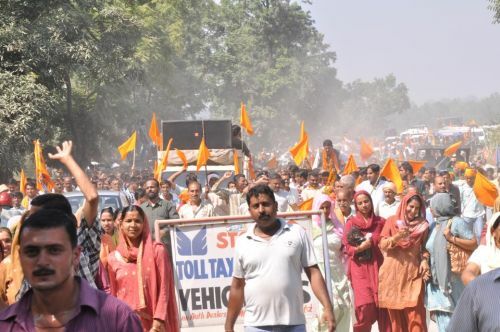 Thousands of his supporters welcomed him with long cavalcade of two-wheelers and four-wheelers. Rakesh Pathania, while addressing his supporters, accused Shanta Kumar for denial of party ticket to him, he announced to expose him publicly and asked why he had been denied ticket when he had worked for the interests of the BJP during the past four and half years in and outside the Assembly. Pathania also leveled serious charges against BJP and claimed that ticket in the state BJP were on sale. He announced his candidature from Nurpur as an independent candidate and stated that electorates of Nurpur segment will give befitting reply to BJP.